This week, Susan and Kitty are on the case to find the Top 10 Alien Homeworlds in Geek Culture! Listen to the full episode on below. Be sure to subscribe to the podcast on iTunes and Youtube, and leave a 5-star review if you enjoy the content! Be sure to listen along to catch our reasoning behind these absolutely stellar choices- from the pages of Dune to the BBC network, we’ve filled this week’s Geek Culture Countdown with a solar system’s worth of selections! We the Power Battery Planets as this week’s honorable mention, covering an entire spectrum of Alien Homeworlds from the Green Lantern comics in the DC Universe. Kitty claims Arrakis for the 10th spot on our list, from Frank Herbert’s sci-fi epic Dune. 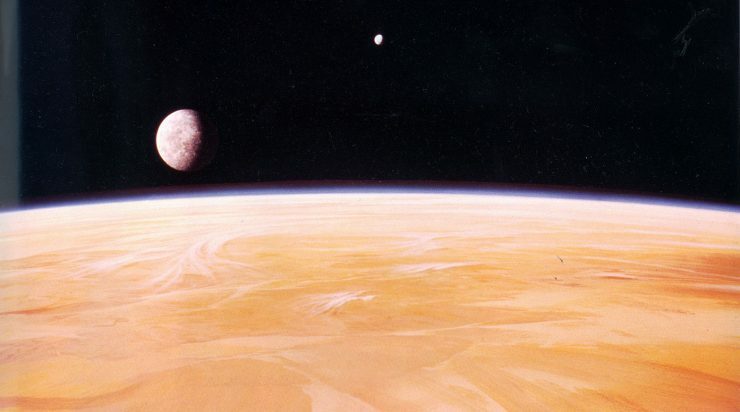 Which real-world planet has a moon named after Arrakis? Listen along to find out! Susan puts fresh blood into the list with Drakulon at number 9, the storied homeworld of the vampiric vixen Vampirella! Thundera, ho! The peaceful planet of the Thundercats claws its way into 8th place. Putting Kobol in 7th brings Battlestar Galactica into our countdown for this week. Brother and sister planets share 6th on the countdown as we take a trip to the Masters of the Universe realm. Qo’noS comes in 5th, securing Star Trek a spot in the countdown. The Marvel Universe makes its mark at number 4 with the homeworld of the Kree Empire, and home of heroes and villains like Mar-Vell and Ronan the Accuser. It’s about time Gallifrey appeared on the list- this fabled home of the Time Lords from Doctor Who takes the 3rd spot in our list. Twin suns take 2nd as the countdown visits a galaxy far, far away with Tatooine! The ill-fated planet of Superman and the Kryptonians takes 1st on our list of Alien Homeworlds! Find out why by listening along on iTunes or Youtube.